Bakso Akiaw 99 Medan, as the name says, is originally from Medan but now they already have 5 branches in Jakarta, with its primary (bigger) outlet located at Jl. Mangga Besar Raya. Other than that, they also have one in Muara Karang, Gading Serpong Tangerang, and 2 outlets in Kelapa Gading – but as far as this post is written I’ve never been to any other outlet so I can’t really compare each of them. They only open since 3 PM until midnight, with hectic crowd in and out the restaurant busily. Space-wise, the one at Mangga Besar could accommodate up to 60 guests at once and the turn-over rate is going strong, means that you eat, you pay, and then you give your seat to others in need. Price-wise, I have to admit it’s not that cheap especially compared to the typical Bakso streetfood vendors. Well I think this one’s categorized as restaurant anyway, so please do expect paying ~IDR 50k per meal per person (drinks inclusive), as one complete portion at Bakso Akiaw may cost you IDR 37k-ish. Here’s what you also should know: IT’S WORTH EVERY RUPIAHs BEING SPENT. #FANBOYALERT: WHAT’S SO GREAT ABOUT AKIAW? The tasty noodles. The simple-yet-complex flavorful broth. The tender meat. The three kinds of meatballs. The fresh cilantro leaves & chopped greens. The addictive sambal or chili condiment. Everything. Every element is executed very well and together they add certain depth into the overall eating experience. Choose your noodle. There are 3 types of noodles to choose from: thin vermicelli/beehoon, kway teow, and hokkien noodle. My favorite? The thick yellow Hokkien noodle of course; because I love the chewy texture and it’s already packed with so much flavor when served. Choose your meatball. Again, 3 types of ‘bakso’ to choose from: bakso daging (beef meatballs), bakso urat (tendon meatballs), and bakso ikan (fish meatballs). Choose your topping. 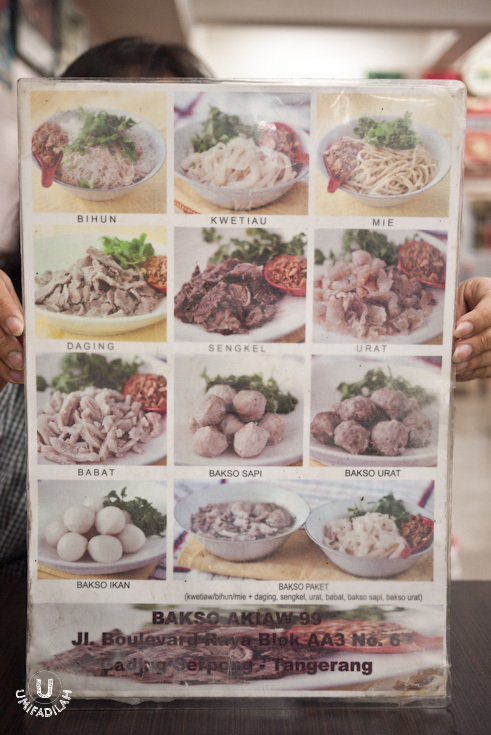 One special thing about Bakso Medan: It’s never just about the meatballs. Most of the time it’s also about the tender meat slices, floating in real abundance that you could actually call it ‘beef soup’ instead. Make a choice between thinly sliced beef, shank, tendon, and offal – OR, pick all of them. Easy. 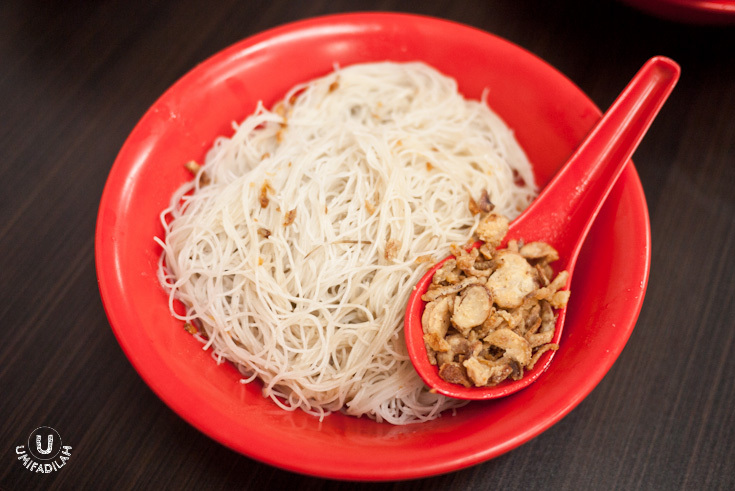 Thin vermicelli/beehoon drizzled with sesame oil and special sauce. Most of my friends are crazily addicted to Akiaw’s beehoon, but for me it sits as number two because somehow I tasted the coating sauce to be a bit acidic compared to the yellow Hokkien noodles. Still delicious, though. 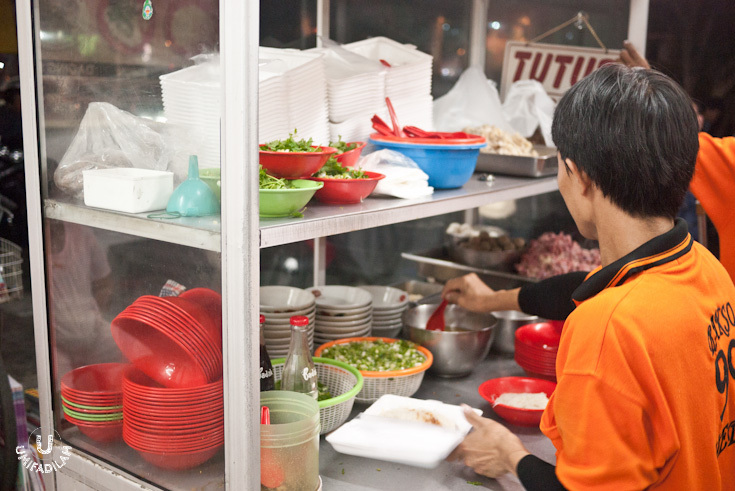 Kway teow (kwetiau) at Bakso Akiaw. It’s a matter of preference, really. If you like wide noodles you should opt for this one instead. Thick yellow Hokkien noodle. Perfectly bouncy and chewy, super fragrant & tasty coating sauce, has that addictive savory taste that makes me wanna slurp them over and over again. They’re good alone but with the broth they’re so much better. What I usually order is pretty simple: Original meatballs with LOTS of beef and shank slices only. I mean, DID YOU SEE THE SHANK SLICES?! The alternating layers between beef and transparent fat, floating in an extra-clear fragrant soup (do NOT take this lightly – they might looked so simple but let me tell you, slurping rich and tasty broth like this can change your mood in an instant.) MIND = BLOWN. If you love cow’s offal (such as tripes) and tendons then you shouldn’t miss it either at Akiaw. I personally don’t eat them but I heard it’s very tender. Fresh cilantro leaves and chopped spring onions. I’m a BIG fan of wansui/cilantro leaves, and although we don’t usually eat them with meatball soup, it’s a different case with Medan-style Bakso. The addition of herbs gives familiar zing to the beef broth, and it’s just really wonderful. Love! 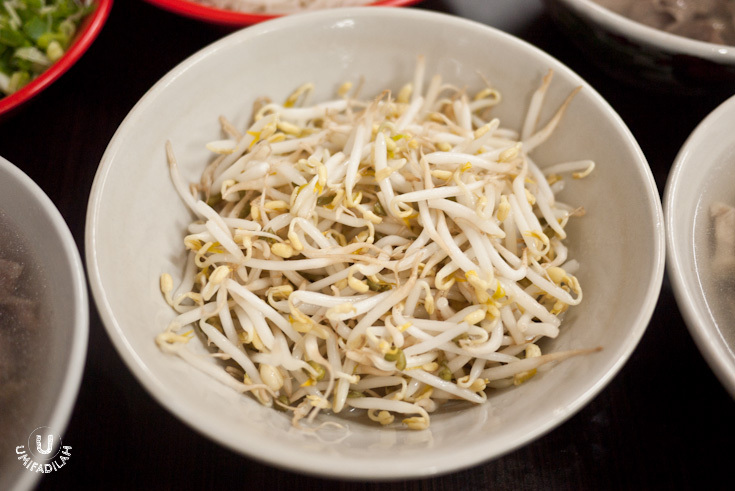 It’s not exactly listed on the menu but the regular customers already know that they have the option to order an additional bowl of blanched beansprouts. Crunchy vegetables? I couldn’t say no to that. Full meal at Akiaw. I remember it’s only been 2 weeks yet I’ve paid my visit at least 3 times already, LOL. Can’t get enough even though to me, going there is already a challenge! No more words, you just have to add this to ‘101 things to eat before you die’ list.